Mention Pilates to most people who do it regularly and they won’t be able to imagine Pilates without a mat on a floor. Put it another way, people who can’t lie on the floor probably can’t imagine that they’d ever be able to do Pilates. So, what’s to be done? Chair Based Pilates! Strength development, especially functional strength – the kind you need on a day to day basis, to get out of a chair, lift shopping bags or climb the stairs for example. Looking at that list then it seems daft to deny those benefits to people simply because they can’t lie down. So what does Chair Based Pilates involve? Chairs: Sturdy ones with a supportive back and no arms. Props/Small Equipment. These can add variety to the work out which would otherwise be rather static. Spikey balls for self massage of the feet, hands, and arms. Or use them whilst leaning against a wall where they’re great for the shoulders and neck. Soft balls – could be used to throw and catch – great for hand eye coordination, challenging reaction times and general entertainment value. Depending upon the chairs they can aid spine extension, or be used for strength work. Squeeze/stress balls to improve hand grip and strength – great functional exercise. Resistance bands to assist both stretching and strength work. Walls – assist with balance work, shoulder strength, supported spine flexion. What would a Chair Based Pilates session typically involve? 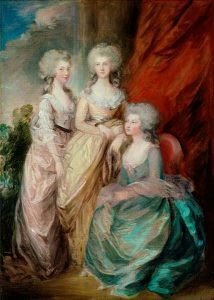 Always plenty of focus on body alignment and sitting properly, but comfortably: as if you’re a genteel character from nineteenth century literature or eighteenth century royalty like the three daughters of George III immortalised here and painted in the 1780s. They knew a thing or two about how to stand and sit. Emphasis on Breathing. We want to encourage gentle diaphragmatic breathing during the session and indeed during life in general. Every exercise has core stability at its heart: the right breathing, an awareness that the body is relaxed yet stable/secure and the trunk doesn’t buckle /twist/compress unnecessarily during the exercise. Foot mobility, arches of the foot, toes, ankle, heel and toe points. You could spend ages on this vital and underrated part of the body. We don’t give our feet the respect they deserve, and we certainly don’t mobilise / exercise them enough. Chair based Pilates is a really valuable opportunity to address this. Some people may be self conscious about taking the shoes off (or not be able to reach down to their feet and not wish to be assisted). 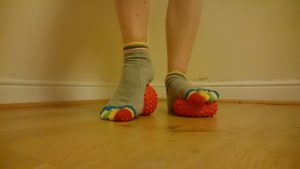 But we can go home and do these exercises at home whilst watching Strictly if needs be… And shoes or no shoes, we can always mobilise the ankles. Sit to stand. This works the back of the legs and the buttocks. 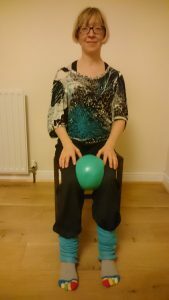 Can also be done as stand to sit – a classic squat. There is a half way exercise, which was taught to me as a “Jockey Lift” because that’s as far as you go – to the point when you look like A P McCoy on a champion horse. Pelvic floor work. Absolutely vital. Best done standing and sitting. Worthy of a blog post in its own right! Upper body strength work: the resistance bands can be used here to work the front and back of the arms and the wrists. When it comes to shoulders, mobility is preferable to strength work – exercises that keep the shoulder blades moving and keep the range of movement in the arms. The chest and shoulders benefit from the dynamic stretching that comes from the mobility exercises. Fingers, thumbs and wrists can be mobilised. and this kind of work is surprisingly helpful for people with joints stiff from osteoarthritis. The wrists can also benefit from strength work and this is one part of the body that can be worked whilst sitting in a chair. Exercises for spine mobility: rotation, side bending in particular. If you can add a bit of standing work…..
As in Yoga, the idea of increasing flexibility comes with the territory, but nevertheless it can be helpful and enjoyable to do some specific stretches and they work beautifully incorporated into chair work. 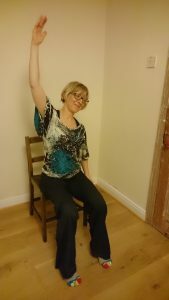 What is rather tricky in Chair Based Pilates? A lot of overt shoulder strength work doesn’t work well in this situation. The body is better supported standing or in “all fours” for this. Working the buttocks and backs of the legs is almost impossible and for me this is the biggest loss in chair Pilates. These muscles (often referred to as the glutes and hamstrings) are vital for both movement and stability and they get weakened and dysfunctional with prolonged sitting……but you can’t win ‘em all, and participants who are able can do some leg exercises in a standing position. Moving the spine in extension – back bending. This is worth doing because it is such a valuable aspect of movement but it is much harder than when lying down – and it’s hard enough there! 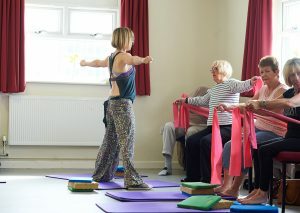 For further details and classes, please see our page on Chair Based Exercise.